April Fishing at its Best! 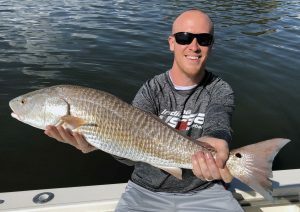 Corey displays one of the 30-plus inch redfish he caught, that are schooling on the flats. Finally, the Tampa Bay water temperature is in the 70’s to stay and it’s only going to increase from here on. Once the water temperature hits the fishes’ confront level, they become more active and in turn, very hungry. The snook fishing has been ready good all year long in certain locations, but now they’re starting to spread out on the flats making it possible to catch them just about anywhere. Double, even triple hook-ups are common and catching 30 or more snook per outing is the norm. The best news, recently, is the return of large redfish. Redfish prefer warmer waters and with the spike in temperature, my clients have been catching plenty of fish over 30-inches. Redfish are primarily schooling fish, so if you catch one, more than likely others are close by. Many times, these large redfish are being caught in some of the very same spots as the snook. Spanish mackerel have returned to the bay also. Spanish mackerel are a blast to catch on light tackle, because they hit live bait hard and fast. Once hooked, they make long runs and because I use a light drag setting on the reels to prevent cut-offs, it takes awhile to bring them to the gaff. The annual spring king mackerel migration is in full swing too. As king mackerel, aka kingfish, start following baitfish north to the panhandle, massive amounts of kingfish can be caught within a mile of the coastline. In fact, most tournament-winning fish this time of year are landed within a mile of shore or within the mouth of Tampa bay, this time of year. Personally, I prefer to slow-troll live bait for kingfish, because you can use lighter tackle and my clients get to play the fish right up to the rod tip. Some charters like to drag spoons behind a fishing planner at higher speeds so they can cover more ground. 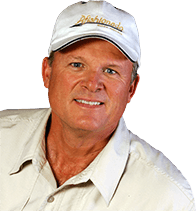 Both methods work, but when using a planer, you must use heaver tackle and you only get to fight the fish up to the planer, then you have to handline the fish in the rest of the way to the boat. This month tarpon will be making their presence known at the mouth of Tampa Bay and one of the best spots to encounter an early April tarpon is at the Sunshine Skyway Bridge. The trick to getting a solid hook-up is to anchor your boat on the up-tide side on the bridge and drift baits back under the bridge while establishing a constant flow of fresh cut bait chum. The tarpon fishing really picks up during May and June, so plan accordingly! Usually, I get too busy to write fishing reports as often as I’d like, so, if you’re interested in seeing my most recent post, please like my, Facebook Page to receive updates. For charter reservations call/text Wade at 813-286-3474.
https://www.afishionado.com/wp-content/uploads/2019/04/Corey-Red-WEB.jpg 1357 1920 wpfishwade https://www.afishionado.com/wp-content/uploads/2018/03/afishionadoheader2.jpg wpfishwade2019-04-02 12:31:022019-04-02 13:03:57April Fishing at its Best!